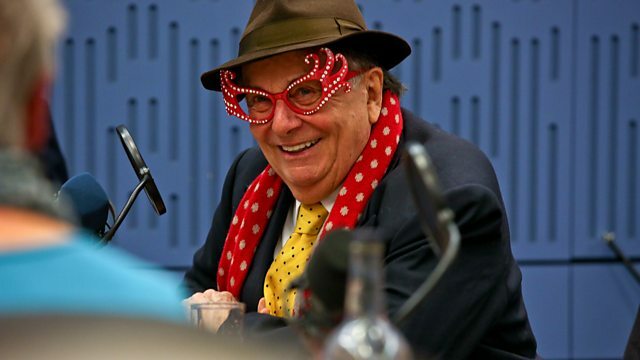 Clive Anderson and Emma Freud are joined by Dame Edna Everage, Alan Carr, Leonie Orton and Jake Arnott for an eclectic mix of conversation, music and comedy. With music from Kefaya and Antonio Forcione and Sarah Jane Morris. 'Dame Edna’s Ednapaedia’ is published by Head of Zeus on 20th October. ‘Alanotomy’ is published by Michael Joseph and available now. 'I Had It In Me’ is published by Quirky Press on 21st October. 'The Visa Affair' is on Sunday 9th October at 21.00 on BBC Radio 3. 'Radio International' is out on 14th October on Radio International Records. Kefaya are playing at Rich Mix, London on 14th October and 25th November and Sheffield University on 25th October. 'Compared To What' is available on 26th October. Sarah Jane and Antonio are playing at Ronnie Scott's, London on 10th and 11th October and King's Place, London on 26th October. Check their websites for further dates.